The global crop protection market in 2017 increased at a rate of 1.9% in nominal terms over that of 2016. As such, the market for crop protection products in 2017, when measured at ex-manufacture level and using average-year exchange rates throughout, comes in at U.S. $54.15 billion. In the August issue of AgriBusiness Globalâ¢ magazine we focused on the transformation of the Indian market for crop protection products between 2009 and 2017. India remains one of the fastest-growing markets globally from the perspective of overall economy and the agrichemic al market. On a global basis India is the fifth-largest market for agrichemicals and also one of the fastest-growing markets. This article is focused on the Southeast Asian markets and, in particular, Indonesia. While collectively the 11 markets covered (at U.S. $2.3 billion) are only just larger than the Indian market in terms of sales (Fig. 1), they do offer qu ite different individual niches and opportunities. Geographically speaking, Southeast Asia is a subregion of Asia, consisting of the countries that are south of Japan and China, east of India, west of Papua New Guinea, and north of Australia (Fig. 2). In many aspects the region is dominated by Indonesia, which accounts for more than one-third of the regionâs U.S. $2.7 trillion nominal GDP and almost 40% of the regionâs estimated population of some 650 million. 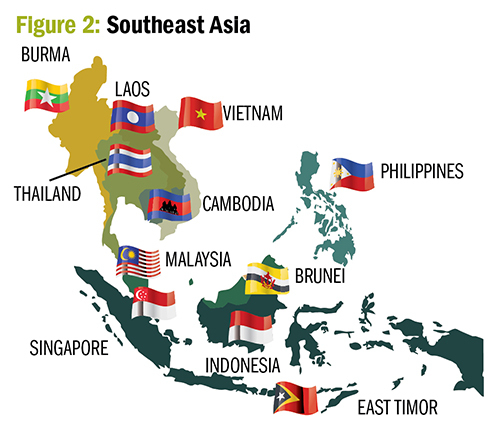 With the exception of East Timor, all the nations are part of the Association of Southeast Asian Nations (ASEAN). Among other aspects, the group has secured various low and free trade agreements between themselves and other nations, most notably China and the U.S. Unlike GDP and population, however, the regionâs trade is dominated by Singapore (in electronics) whereas Indonesiaâs total exports, including palm oil, are overall quite small by comparison. Crop area is, however, very much in line with the ratios of GDP and population in terms of the relative importance of Indonesia. According to the latest available Food and Agriculture Organization Corporate Statistical Database (FAOSTAT) data (2016), the region as a whole has a cropping area of some 122 million hectares (ha); an area that is a little more than that of the U.S. (at 105 million ha) but considerably less than that of India at close to 200 million ha. Rice dominates the region as a whole, accounting for close to 40% of the overall cropping area. Thereafter, âother cropsâ is the most significant in terms of area. Other crops in this instance include more than 30 different named crops, but the plantation crops of palm oil, rubber, coconut, coffee, and cocoa beans account for close to 90% of that area. 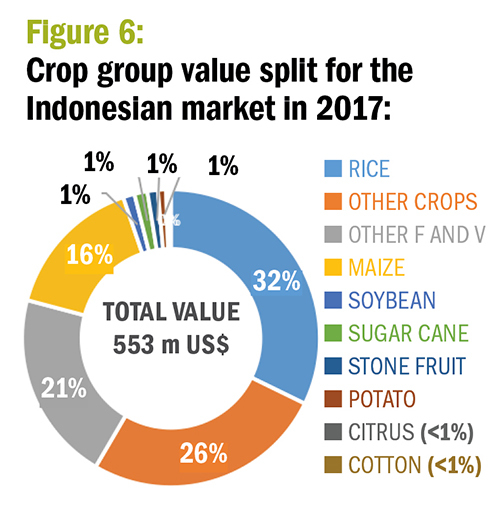 That importance of the plantation crops is further increased within Indonesia, where the crop group of âother cropsâ accounts for some 47% of the total crop area. As with the region as a who le, other crops in this instance include a number of named crops, but once again the plantation crops of palm oil, rubber, coconut, coffee, and cocoa beans account for more than 92% of that area. In all of the plantations mentioned for Southeast Asia, Indonesia ranks as the top area, with, for example, almost twice the area of palm oil as compared to Malaysia. 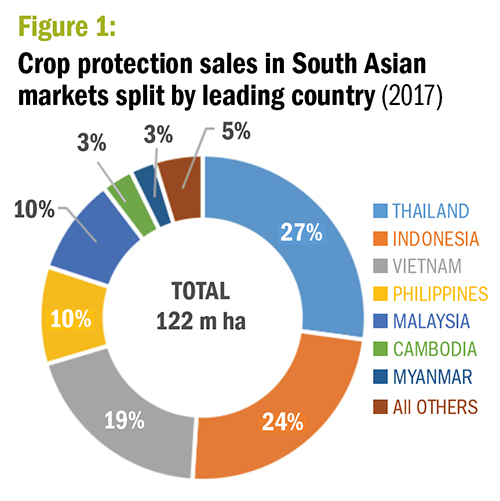 Crop area change over recent years within the Southeast Asian region has been broadly similar to crop area change on a global basis, with an increase of some 6% since 2008. This small change in crop area has, however, been surpassed by significant growth in the overall market value since that time, which reflects an increasing spend per ha. The same trend is seen on a global basis (where the market value has increased by close to 25% since 2008), but in the Southeast Asian region this overall growth has been closer to 75% when comparing value in 2017 to those from 2008 (Fig. 3). When looking at the same data for Indonesia, a very similar trend can be seen, although the impact of the decline in the market from 2012 until 2017 is more dramatic in Indonesia as compared to the region as a whole (Fig. 4). 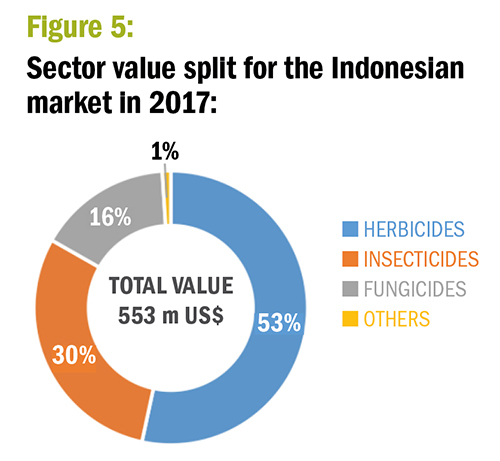 In looking for future developments for the Indonesian crop protection market, many of the trends over the last year are likely to continue. One such trend is the increasing importance of fungicides (largely at the expense of insecticides) as a proportion of the market. In value terms, fungicides have grown from 8% to 16% (Fig. 5) between 2008 and 2017. The use of fungicide seed treatments is also increasing, especially over the last two to three years. Another trend since 2008 is the declining importance of the plantation crops (other crops), which, as a percentage of the market, accounted for close to 45% in value in 2008 whereas by 2017 that proportion had reduced to just over 25% of the total market (Fig. 6). Editorâs note: Analysis provided by Kleffmann Group is based on data collected from farmer surveys, interviews with distributors in emerging markets, proprietary market trend studies, subject matter experts, and open-source information. Dr. Bob Fairclough is the team leader for amis AgriGlobe, Kleffmann Groupâs agricultural input market trend information and consulting unit. He is an editorial advisor to AgriBusiness Globalâ¢. For more information, visit kleffmann.com.